I am feeling quite delicate as I am writing this blog post today. 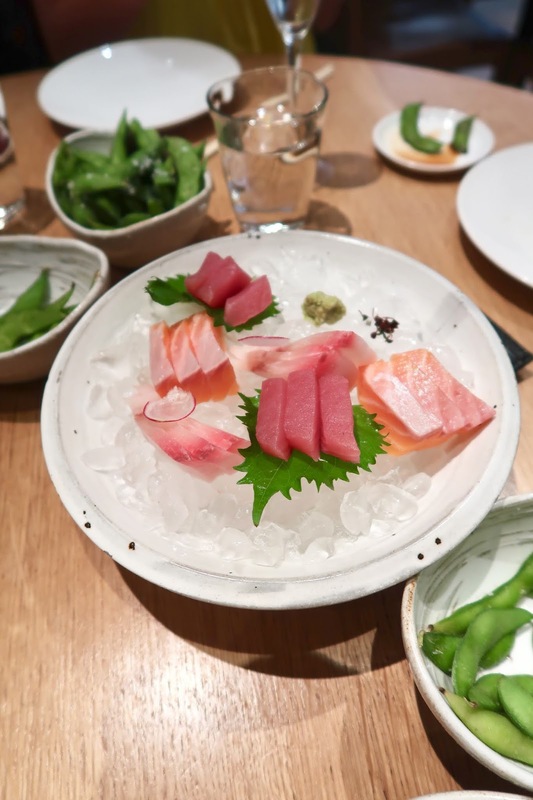 On Sunday I traveled up to London for a wine fueled brunch at ROKA - a modern sushi and Japanese grill restaurant. The word 'brunch' is quite unique to me, I am usually a lunch or dinner sort of girl so I didn't know what to expect when I arrived for a Japanese brunch menu. Located a few minutes away from Somerset House, we took a quick stroll from the Temple tube station and made our way to the main entrance. The interior is incredibly modern but the perfectly positioned Japanese whiskey bottles add a fresh, edgy twist. We were greeted with warm smiles and taken to our table, I didn't know what to expect but the large kitchen area behind us was bursting with sophistication and energy, I couldn't wait to see the menu. 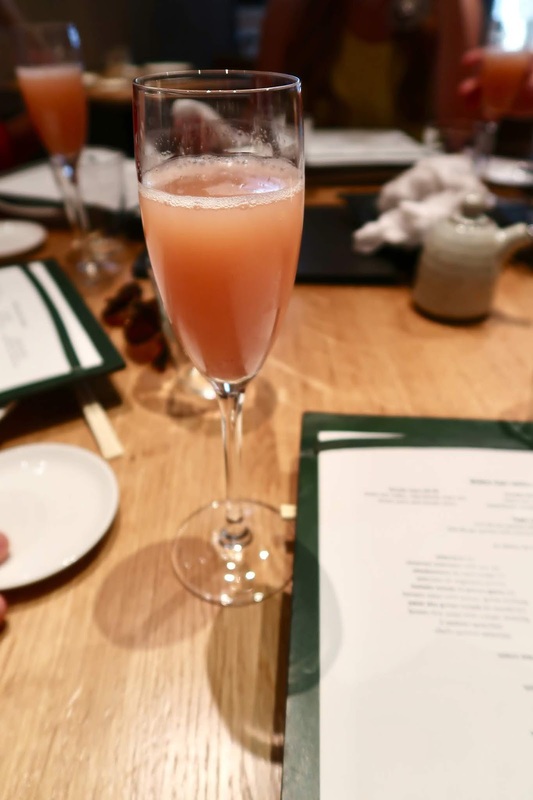 After we were seated, we were each given a fresh Bellini, I loved the fruity taste and I think this was a great way to start our dining experience. Our napkins were placed on our laps by the hostess and we were given a breakdown guide of the menu. When the menu was explained to us, we were told that ten shared dishes would gradually arrive on our table and we would finally pick a main for ourselves. 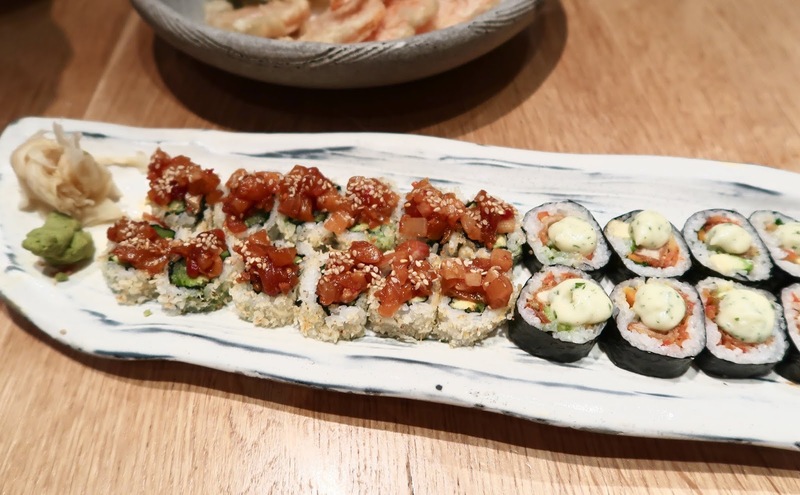 I decided to order the Salmon Fillet Teriyaki with Sansho Salt for my main dish, I am a big lover of salmon but I was actually more looking forward to trying the Sashimi selection. The wine began to flow and I was surprised how much I liked the white house wine, I am not a wine drinker but my wine headache on Monday said otherwise! The boys decided to have red wine and they all selected the mixed meat platter for their main dish. 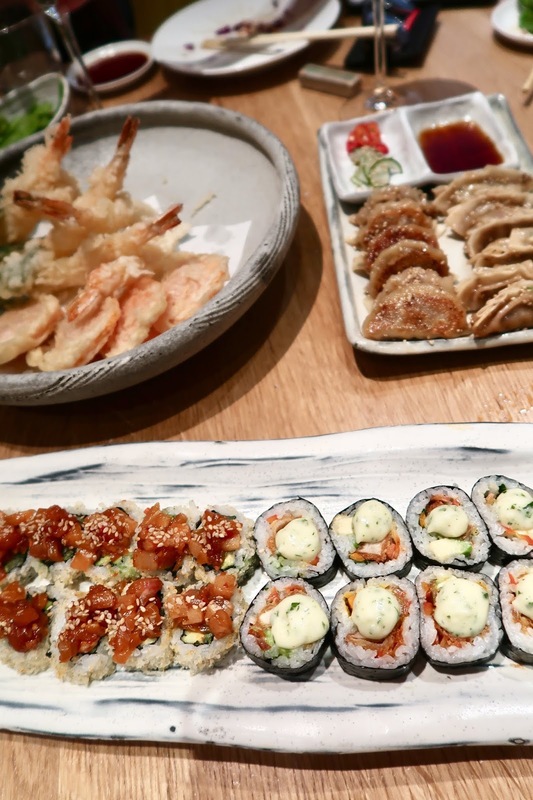 Ollie isn't a very big fan of sushi and fish so he was pretty impressed with how much meat was included on the ROKA brunch menu. 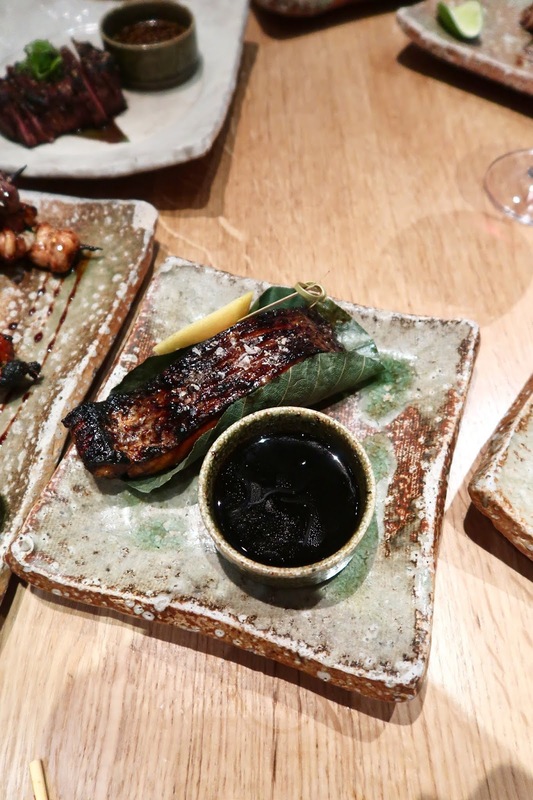 There is certainly something to suit everyone and I couldn't wait to see what the ROKA menu had to offer. 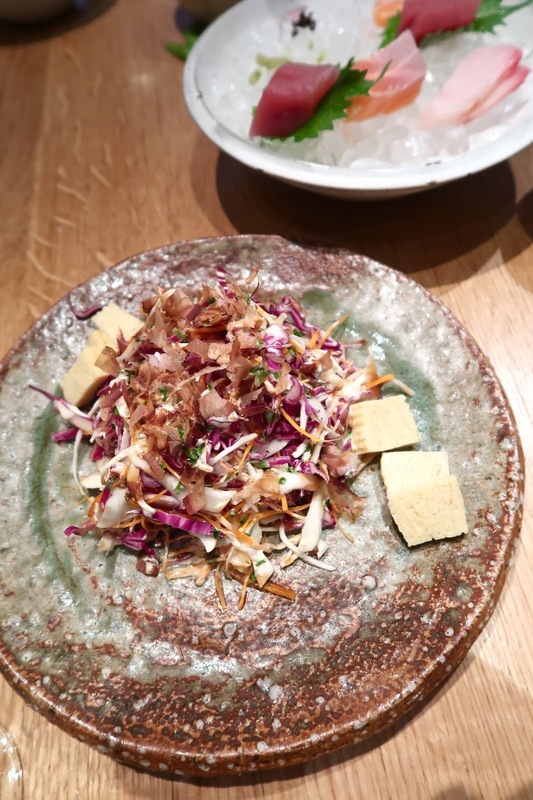 The first dish that arrived on our table was the Otsukemono no Moriawase, a small plate of pickled vegetables. Again, the boys were slightly skeptical of this dish so more for me! We were served quite a few bowls of Steamed Edamame with Sea Salt and they are simply addictive. I loved dipping the beans into the soy sauce. There were six of us sharing the ten dishes and there was plenty of food to go around. The other eight dishes included: robata vegetables with sweet yuzu miso, soba noodle salad with kurumi dressing, chef's sashimi selection, spicy mixed sashimi with cucumber and asparagus, vegetable maki with kampyo, cucumber and avocado, japanese pumpkin and sweet potato salad, chicken and sancho dumplings and last but not least an assorted vegetable and prawn tempura. We noticed very early on how attentive the staff were, our glasses were constantly topped up and our plates were quickly replaced with clean ones. This may seem like a fairly expected sentence when you visit a restaurant but I have had many experiences when I have to get the attention of a waiter or waitress because they haven't brought our food over or checked on us. 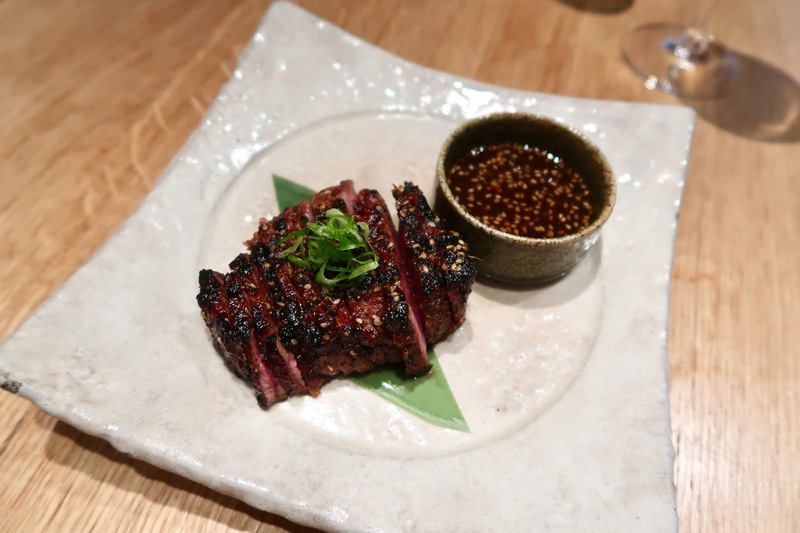 Luckily, the ROKA experience was smooth and effortless and I know this can be very tricky in a busy, London restaurant on a Sunday. Once our ten dishes were brought out, our final savoury meal arrived on our table. I had managed to use chop sticks for the entire meal but to make sure I didn't drop the salmon in front of everyone, I played it safe and grabbed a knife and fork. Sadly my chop stick skills need some work. I peeled the crispy salmon skin off and lightly dipped it into the teriyaki pot on the side and the taste was out of this world. I could easily eat a few plates just of that crispy salmon skin. The pink salmon was cooked to perfection and it fell apart in your mouth - I certainly picked the right dish. The full list of main dishes included a selection of vegetables from the Robata, salmon fillet teriyaki with sansho salt, glazed baby back ribs with cashew nuts, sea bream fillet, ryotei miso and red onion, grilled skewer selection, mushroom hot pot with truffle, baby chicken with lemon, miso and garlic soy and finally the beef sirloin with chilli and spring onion. As you can see, if you are not a big lover of fish, the meat options are pretty impressive. I have been trying to take Ollie to a Japanese restaurant for years now so I'm glad we've found the perfect location where I can get my sashimi fix and he can enjoy a selection of grilled meats. Last but certainly not least, we had a giant dessert platter brought out to us. It was Jack's birthday so we secretly told the staff if they could add a candle to the dessert and they were more than happy to accommodate. The dessert platter was enormous and it was exactly what we needed to complete the brunch experience. I was really excited to try the dragon fruit and the cheese cake was too heavenly to miss. There was a chocolate Buddha on the other side of the tray so you can get your chocolate fix if you aren't a fan of fruit. 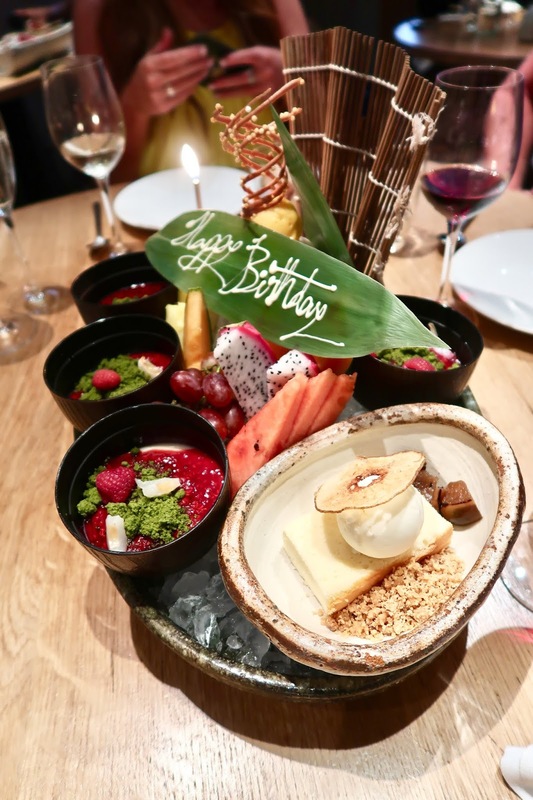 So now you know what the menu was - what did I actually think of my experience at the Aldwych ROKA restaurant? I had no idea what to expect but a sushi and Japanese brunch is exactly my idea of heaven. From the moment we arrived, we were really taken care of and it made the afternoon even more enjoyable. The food was out of this world. You get three hours of attentive service and divine dishes that you can really sink your teeth into. The food is prepared with incredible detail and care and I really love how fresh and unique the dishes were. 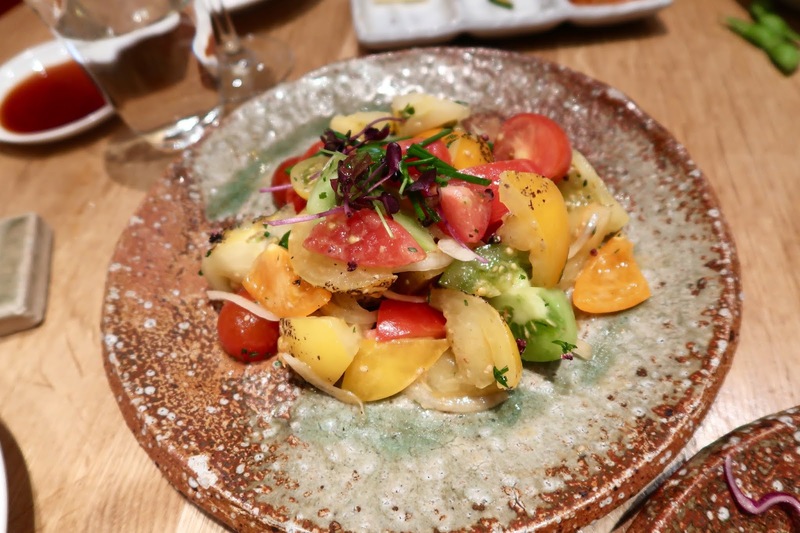 It makes such a lovely change to eat lighter options, the salads were incredibly filling and I love that I didn't feel tired or bloated from eating greasy food, there was nothing heavy or starchy about this menu. You still feel full but this is from high quality food, which is a refreshing change from my usual pizza or burger stops. 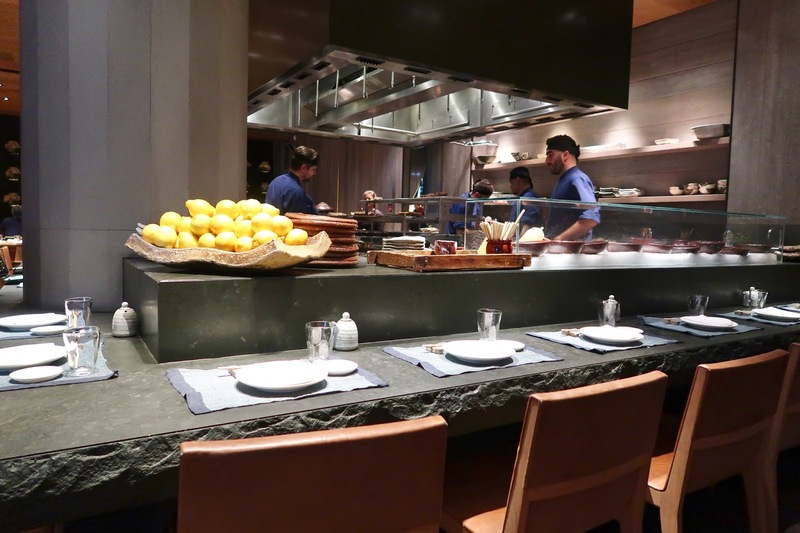 So if you are looking for a lighter option, the ROKA brunch menu will be perfect. If I had to change one thing, I do wish there were unlimited cocktails on the menu, but the wine was very good and its nice to switch up your taste palette. Although I can't comment on the Canary Wharf branch, that particular ROKA is supposed to have a very glamorous and dressy atmosphere. 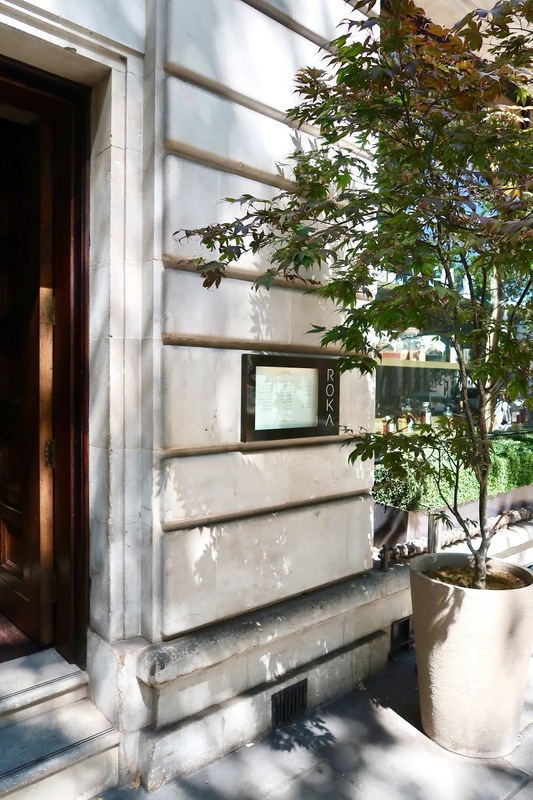 For a Sunday afternoon brunch, I love the idea of sitting back and relaxing rather than dressing up too much, so I'm pretty glad we picked the Aldwych venue instead. It still has a charming atmosphere but it doesn't feel over the top and pretentious. Overall, this is probably one of the best restaurant experiences I have ever had.